Continuing our reviews of cigars released in 2018, today I’ll be reviewing the Macanudo Inspirado Red toro. I’ll be honest, I’ve never been a huge fan of Macanudo. Most of their older, more standard blends are (in my opinion) bland and uninteresting. But it can’t be denied that under the leadership of General Cigar Co., Macanudo has made some big strides in recent years, especially after releasing the Macanudo Inspirado Black, White, and Orange. The Inspirado Red is the most recent addition to the line and leverages an interesting array of tobaccos (more on that below). So let’s get to the review. After spending a bit more time with this cigar, I’ve decided that I really like the band. At first it looks like a straightforward red and silver band, but on closer inspection the secondary geometrical design elements are actually very cool. The outer wrapper leaf is a marbled brown color with two noticeable veins. The cigar seems packed fairly well, though there is a significant softness when squeezed about halfway down the cigar, which I hope won’t cause tunneling or other burn issues. Off the foot, I pick up lots of red and black pepper as well as some earth and leather. The draw is just right, about a 6/10 in terms of restrictiveness. 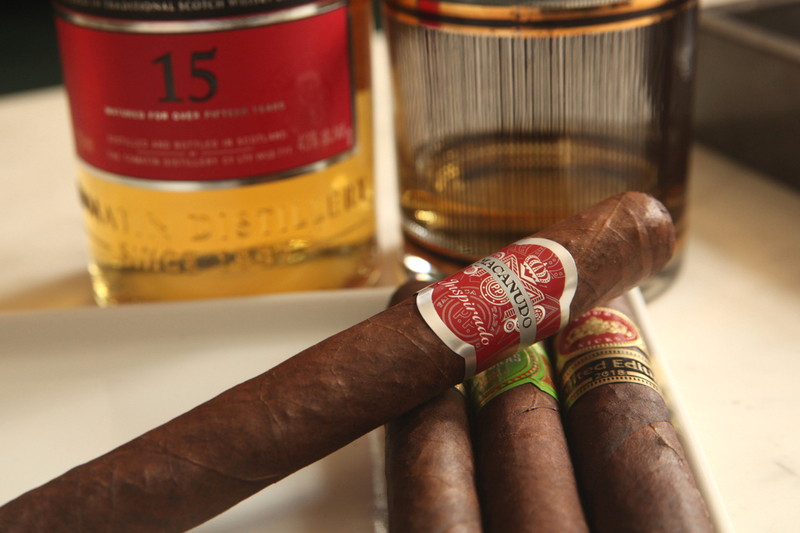 The Inspirado Red kicks off in a surprising way, and thankfully with great smoke production. The cigar is very bold on the palate, coming in aggressively with lots of strong spice, pepper, a bit of blackberry and chocolatey sweetness on the palate. On the nose, however, the smoke is rather gentle and nuanced, with classic macanudo aromas of floral, dried grass, and touches of white pepper. As other reviewers have noted, the retrohale is decently aggressive and heavy on red pepper. Overall, I’d put the cigar at medium to full flavor, medium body. An inch in, a nice caramel note sneaks into the aroma. The burn is mostly even and the ash is still holding solidly. Then, as the cigar burns into the second third, the strength actually decreases slightly, which is welcome since the first third was at times a bit much. There’s little change to the flavors, with cocoa, coffee, and oak in the fore and a slight grassiness in the aroma. The burn is almost perfect, just some slight waviness. Smoke production stays excellent. The final third is where some problems arise. The soft spot in the filler tobacco that I noticed before lighting loosens the draw considerably, and the flavor becomes dominated by red and white pepper with very little sweetness to balance it out. Thankfully, that only lasts a few minutes, and sweet cream and blackberry notes come back in to round the profile out. Near the last inch, the smoke has turned very hot, providing a good opportunity to set the cigar down. At roughly $7 a cigar, the Macanudo Inspirado Red is a stellar value. I like how the cigar presents a new take on the classic Macanudo profile while still retaining the best of the traditional Macanudo vibe. As a side note, this cigar pairs remarkably well with Sherry-finished single malts. I’ve paired this cigar with Aberlour 16 Year with great results.